Apparently geek socks are a thing now. 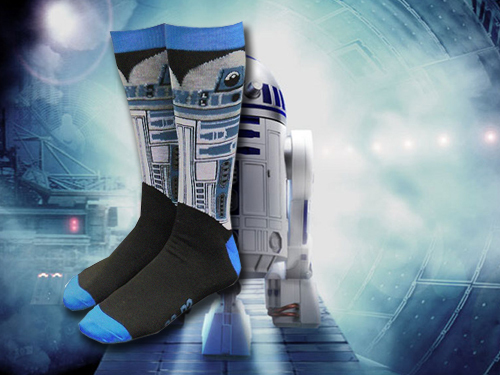 We recently showed you some cool Star Trek Spock socks, and today we bring you some Star Wars R2-D2 and Yoda socks. How many Star Wars geeks do you think will be wearing a pair of these while waiting in line for a week to see Star Wars: Episode VII? I'll admit, I might not be wearing the socks, but I'll be in line to see the first screening of the movie for as long as I have to. You can grab yourself a pair of these over at SuperHeroStuff if you want. They'll cost you $9. The Star Wars Yoda and R2D2 Socks 2-Pack should have been called the 'Scholars of Star Wars Socks'. Honestly, Yoda is one of the strongest Jedi ever and I'm pretty sure that all of those beeps and boops from R2-D2 translate into some kind of mix of Dr. House from the TV show and Frederick Nietzsche! The Star Wars Yoda and R2D2 Socks 2-Pack is a set of two different pairs of socks; one featuring the green man from Dagobah and one featuring the metal prophet! The socks are made out 78% polyester, 20% nylon, and 2% spandex and we've been told that you should probably get these socks; thus spoke R2-D2!